The resupply freighter was captured by the Canadian-built robot arm, under the control of astronauts Peggy Whitson and Jack Fischer, at 9:52 a.m. EDT (1352 GMT) Monday, a few minutes ahead of schedule. Ground teams at mission control in Houston planned to maneuver the cargo capsule to a berthing port on the Earth-facing side of the station’s Harmony module later Monday, where it will be firmly bolted to the outpost for a one-month stay. Since launching Saturday aboard a Falcon 9 rocket from Florida, the Dragon spaceship completed a series of orbit-adjustment burns to fine-tune its approach to the space station. The automated rendezvous Monday appeared to go normally, delivering 5,970 pounds (2,708 kilograms) of equipment and experiments, including a habitat with 40 mice to help scientists evaluate the effectiveness of a therapeutic drug designed to promote bone growth. 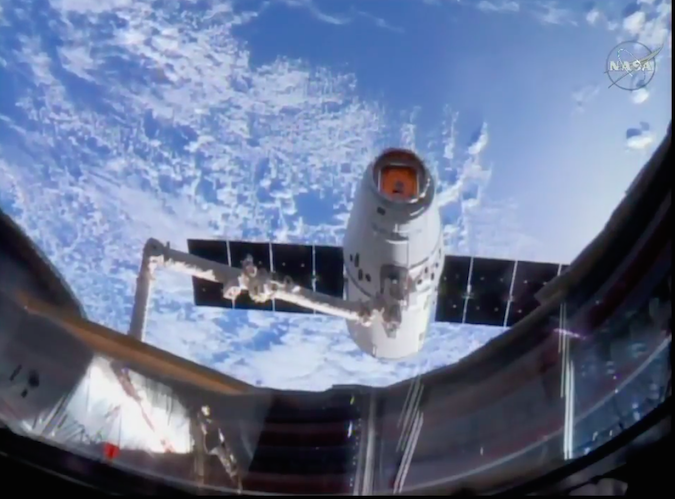 Researchers will study the response of the mice to the treatment, called NELL-1, and send back 20 of the live animals to Earth on the Dragon spacecraft when it departs the station July 2. The other 20 will remain on the space station, allowing scientists to conduct comparative studies of their bones and other tissues. Other gear aboard the Dragon supply ship includes an X-ray astrophysics experiment to observe neutron stars, the most dense objects in the universe, which form when certain types of stars explode in supernovas at the end of their lives. Engineers will also test a new type of power-generating solar panel carried inside the Dragon capsule’s unpressurized trunk. The Roll-Out Solar Array deploys like a party favor, making for a lighter, more compact design than conventional fold-out arrays used on most satellites. 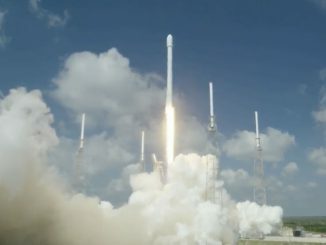 Several thousand fruit flies for a cardiac experiment, an upgrade for the space station’s microscope, an Earth-viewing platform, and food and provisions for the space station’s crew were also on the Dragon, which was the first SpaceX cargo capsule to fly to the research lab a second time. The spacecraft first launched in September 2014 and spent 34 days in orbit before splashing down in the Pacific Ocean. SpaceX replaced the craft’s heat shield and much of its avionics, but the structure, propulsion system and other parts of the capsule are the same. “We want to thank the entire team on the ground that made this possible, both in Hawthorne (SpaceX’s headquarters in California) and in Houston, really around the whole world, from support in Canada for this wonderful robotic arm, Kennedy Space Center’s launch support, to countless organizations which prepared the experiments and cargo,” Fischer said shortly after Dragon arrived at the space station. “These people have supplied us with a vast amount of science and supplies, really fuel for the engine of innovation we get to call home, the International Space Station,” Fischer said. The Dragon was the first reused spacecraft to reach the space station since the shuttle Atlantis arrived on its final mission in July 2011. 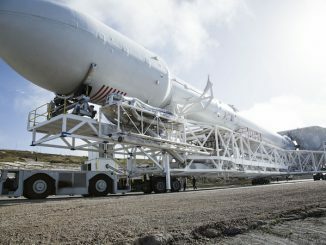 “We have a new generation of vehicles now, led by commercial partners like SpaceX, as they build the infrastructure that will carry us into the future of exploration,” Fischer said. 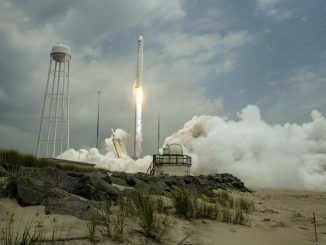 Monday’s rendezvous of the Dragon capsule came a day after another commercial supply ship, Orbital ATK’s Cygnus, departed the space station after a month-and-a-half there. The Cygnus spacecraft is heading for a destructive re-entry over the South Pacific Ocean on June 11, disposing of the station’s trash. But the craft will first deploy several CubeSats and conduct a fire experiment in orbit. The Dragon spacecraft will return to Earth next month with nearly 2,000 pounds of cargo and research specimens, aiming for a parachute-assisted splashdown in the Pacific Ocean southwest of Los Angeles.